Did you know that Charms Creations are a sponsor for White With 1 this month?! So, I thought I had better make sure I did this challenge and it is such a gorgeous colour too, Biscay Bay, a beautiful blue to remind us of summer in these colder winter months! I found that the new distress ink Mermaid Lagoon was a pretty good colour match so started with creating my background. 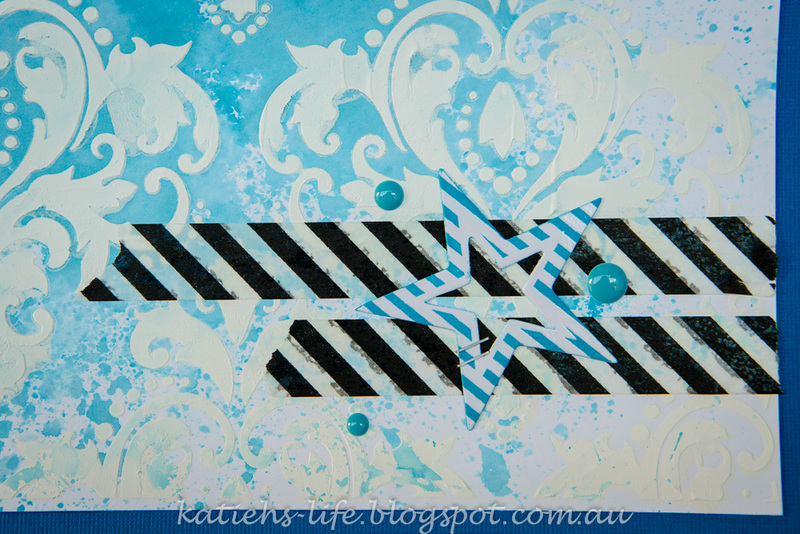 I used a new stencil that I picked up at the Craft Show by Stencil Girl and used it with gesso on my background. Once dry I swiped my ink pad onto a piece of plastic bag and spritzed with water and painted onto the stenciled area, I love how the gesso resists the ink. I wiped over the gesso area with a baby wipe afterwards to clean it up a bit too. I have some older Heidi Swapp watercolour shapes that I coloured up with the ink, I also used this as my title. 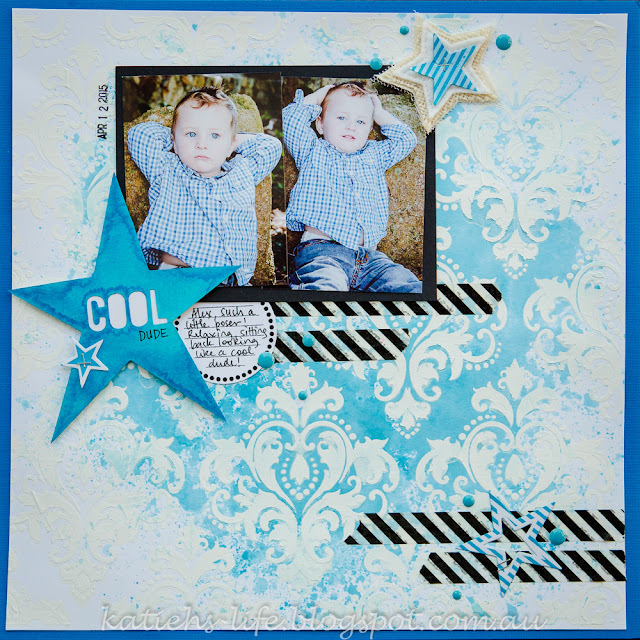 This one is one of the Heidi Swapp resist shapes (colour magic I think?!) They came up a treat with the ink. 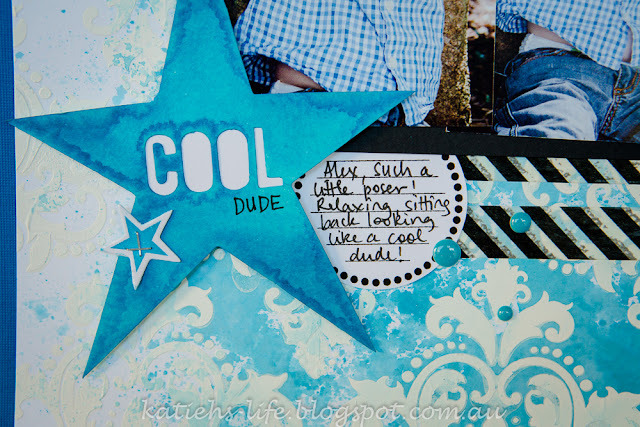 Of course I had to use a Charms Creations on my page. 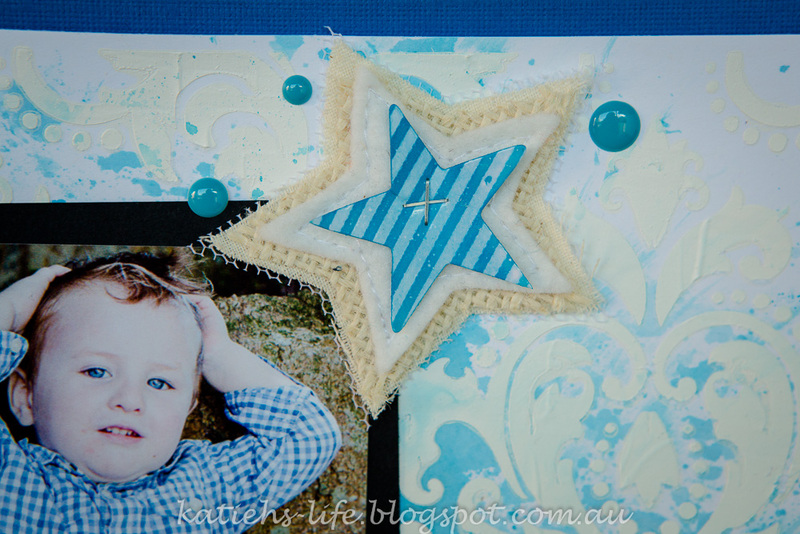 I chose a white felt star and layered it with a coloured star that I stapled on for interest. The only other addition was some black stripe washi tape for contrast and some enamel dots to finish. Oh and the little cutie is my nephew! I think he is on his way to being a ladies man! Make sure you check out the WW1 challenge and inspiration and maybe you can win some Charms Creations too! Those blue eyes, he is so cute. Gorgeous page Katie. Thanks for joining in with us at WW1. The photo is so cute, and the back ground looks gorgeous.. beautiful take on the challenge this month.. thanks for joining in with White With One..
Gorgeous background , stunning layout.